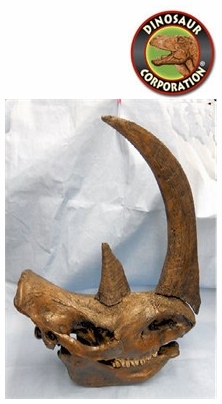 Woolly Rhino Skull. Coelodonta antiquitatis. * Skull and jaw measurement: 31 inch x 13 inch x 14 inch (79cm x 33cm x 36cm). Woolly Rhino is an extinct species of rhinoceros native to the Northern Steppes of Eurasia that lived during the Pleistocene epoch and survived the last glacial period. An adult Woolly Rhinoceros was typically around 3 to 3.8 metres (10 to 12.5 feet) in length, with an estimated weight of around 1,800�2,700 kg (4,000�6,000 lb) or 2,000 kg (4,400 lb). The Woolly Rhinoceros could grow to be 2 m (6.6 ft) tall.